Q: I heard about a federal lawsuit seeking millions of dollars for property owners impacted by the construction of the Legacy Trail. Does that impact the $65 million bond referendum or the construction of the trail? A: No. Landowners along the proposed northerly route of the trail will be compensated if their property rights are affected, but these are lawsuits against the federal government and the federal government will compensate the property owners accordingly. It has no impact on the $65 million bond, the construction of the trail extension, or the county government. Q: Why extend The Legacy Trail? Promotes healthy lifestyles for all ages by providing an attractive and safe place to walk, run, skate, cycle, explore local nature viewing opportunities, commute to jobs or run errands. Converts an unused, overgrown rail corridor to a highly-used recreational and commuting trail, reducing traffic congestion, improving air quality. Promotes local economic activity: Many studies have shown that multi-use trails promote local economic activity, stimulate tourism, raise nearby home values, promote healthy lifestyles for all ages, and reduce employee healthcare costs. Provides nearly 30 miles of continuous non-motorized, paved, multi-use trail link between communities and amenities. Q: How will the bond referendum passed in 2018 pay for the extension? County will borrow money in the form of bonds which will be paid back over 20 years. First draw will be for the purchase of the corridor in May 2019 (as mentioned below), construction design, and North Port implementation. Second draw will be for actual construction, timing TBD. Maximum cost per household: Just $8 / year for each $100,000 assessed home value (not market value) for up to 20 years. Actual cost per household will be adjusted as needed based on real costs and other funding received. Q: What will happen now that the referendum has passed? April 30, 2019 – Trust for Public Land (TPL) and Sarasota County must complete due diligence review. May 30, 2019 – TPL and Sarasota County must close on the $30.1 million purchase for the property (contingent on due diligence). November 29, 2019 – (180 days after closing) Seminole Gulf must complete removal of rails, switches, and signal equipment. Buy the existing railroad right-of-way to Payne Park / Fruitville Rd. Build bridges over Clark and Bee Ridge roads. Add parking areas, trailheads, rest stops, rest rooms, and landscaping. 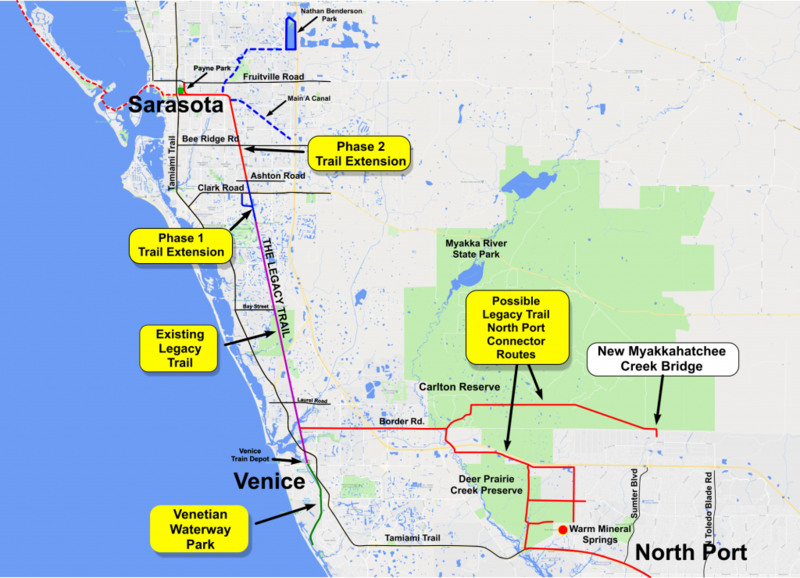 Develop connector to North Port (exact route to be determined – see map).